So I have been doing a lot of reading and have decided to build a MOI matched set (or as close as I can get with a swingweight scale). I think I have the plan down but I wanted to post it in here to make sure I didn't miss anything. My fitter said a "poor man's" MOI is .4" increment vs. .5" for what it's worth. I'm at .375 (3/8") which should be close enough...hopefully. if you try to get all clubs as close to the same MOI value as possible with the SW scale, and they are 3/8" between clubs, then its 0.5 SWP as progression between clubs. Just use 1.33 SWP pr inch if flat MOI is target. 0.4 SWP between classic clubs of 4/8" or 0.8 SWP pr inch is equal to a 4 inch fulcrum, or a match as if the point of rotation was 4 inch below the end if the grip. Great. Sounds like I am on the right teack to get as close as can as an amateur builder. Is there anything I am missing before I start assembling? Only very a minor thing - the original increment between PW and 9 is 1/4". If you change to 3/8" increment from the 8 iron - then you could (purely personal choice) keep the PW at 35.5" - and the D5 SW would be about right. 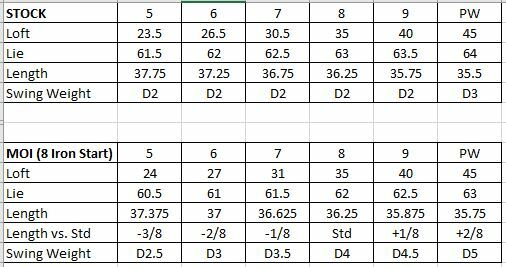 Otherwise for the 1/8" increment between 9 and PW that you have listed in the table, I'd keep the swing weight of the PW closer to the D4.5 instead of jumping to D5. Interesting. I was afraid of the swingweight getting to high so I like this suggestion. There is a small excel app you can play around with to look at the numbers, its METRIC, with freedom to choose what ever play length and resistance slope you like, so do the numbers for both options, test and figure out whats the best for you on that club. I have built a few sets over the years using the same method your are (3/8" +.5 sw) with very good results. I too was concerned about the higher sw on the shorter clubs but maintained the 3/8" gap and found distances blended well and the clubs never really felt "heavy". I think you'll be happy with the results. Good luck. I appreciate all the feedback. I will play with the excel app and see what things look like. Ill report an it update in a couple of weeks after I get them built and put some swings on them.